Since the first major study had compared the techniques of novice and world class powerlifters of similar bodyweight (bodyweights had to be in range of 130 lb. to 225 lb., mean for novices was 169.9 lb. and for experts was 174.2 lbs. ), it was of interest to further investigate the bench press techniques of elite heavyweight powerlifters (see (9)). The film trials of 9 world class powerlifters (3 each from 242, 275, and superheavyweight classes) were selected for analysis. 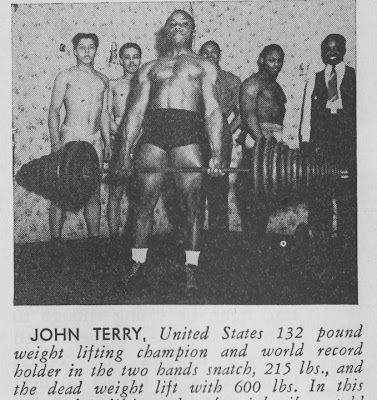 The weight lifted had to rank within the top 10 bench presses in the world at the time of the lift. Top lifters selected as subjects were Cole, Patterson, Wilson, Waddington, Kazmaier, Kenady, Wrenn, Young, and Iams. Trials were further selected so that the bench weights used by all 9 subjects were roughly equivalent (ranging between only 518 and 540 lbs., average 527.9 lbs.). Similar biomechanical film reduction and analysis techniques to (7) were used to analyze the selected lifts. In general, the trends in performance demonstrated by the elite heavyweight powerlifters were very similar to what was reported in (7) for light expert powerlifters contrasted with light novices. The force applied to the bar at key points in the bench press followed a similar trend, the sequence of movements used were much the same for both expert groups, and the degree of control in lowering the bar was similar. Overall, the majority of observations reported in (7) that characterize skilled bench pressing were replicated here despite the increased bodyweight and size of this study’s subjects. However, power outputs were greater for heavy subjects. Also, perhaps the most important result was that torques about the shoulder can be expected to be larger for bigger athletes in the bench press. There may be a need for possible extra training of the shoulder musculature or greater emphasis on technique (horizontal bar path position, etc.) to help accommodate these higher torques. These results (from (9) ) will be fully discussed later. A three-dimensional electromyographic study (6) was conducted to explore, among other topics, the optimal style of bench pressing. More sophisticated laboratory analyses using 3D cinematographic kinematics, electromyography, and musculoskeletal modeling procedures were performed to contrast the technique of high and less-skilled subjects. Results showed existence of a “groove”, or path, that provides maximal performance by permitting optimal muscle involvement and sequencing (particularly pectoralis major, anterior deltoid, and triceps). Furthermore, such changes in technique are reflected in corresponding alterations in joint constraint forces, with potential bearing on injury mechanisms. There results will be discussed further in subsequent sections. Two other studies were conducted to further explore the muscle load sharing in bench pressing. In the first (unpublished data), the current World Superheavyweight bench press record holder (Kazmaier) was filmed with simultaneous EMG records for key upper body muscles. He then performed a large variety of different types of bench presses (varying either grip spacing, where the bar hit the chest, speed of lowering , angling of arms, etc.) Results are discussed later. The second study (8) also investigated the EMG activity simultaneously with 2D cinematographic analysis of regular bench presses versus incline bench pressing at different angles of incline. Results will also be discussed in subsequent sections. (1) Bearn, J.G., “An electromyographic study of the trapezius, deltoid, pectoralis major, biceps and triceps during status loading of the upper limb”, Anat Record , Vol. 140: 103-108, 1961. (2.) Broome, H.L. and Basmajian, J.V., “The function of the teres major muscle: An electromyographic study”, Anat Record, Vol. 170: 309-310, 1971. (3.) Deluca, C.J. and Forest, W.T., “Force analysis of individual muscles acting simultaneously on the shoulder joint during isometric abduction”, J. Biomechanics, 385-393, 1973. (4.) Jonsson, S. and Jonsson, B., “Function of the muscles of the upper limb in car driving. V: The supraspinatus, infraspinatus, teres minor and teres major”, Ergonomics, Vol. 19, No. 6: 711-717. (5.) Jonsson, B. Olofsson, B.M., and Stettner, L.C., “Functions of the teres major, latissimus dorsi and pectoralis major muscles”, Acta Morphol Neerl Scan, Vol. 9” 275-280, 1972. (6.) Madsen, N. and McLaughlin, T.N., “Influence of three-dimensional geometry on success in the bench press”, Abstracts – J. Biomechanics, 1982. (7.) Madsen, N. and McLaughlin, T.N., “Kinematic factors affecting performance and injury risk in the bench press exercise”, Medicine and Science in Sports and Exercise, Vol. 16, No. 4: 376-381, 1984. (8.) McLaughlin, T.M., Garhammer, J., and Madsen, N., “Biomechanical analysis of a multi-station weight training apparatus”, Unpublished research report, Diversified Products Corporation, 1980. (9.) McLaughlin, T.M. 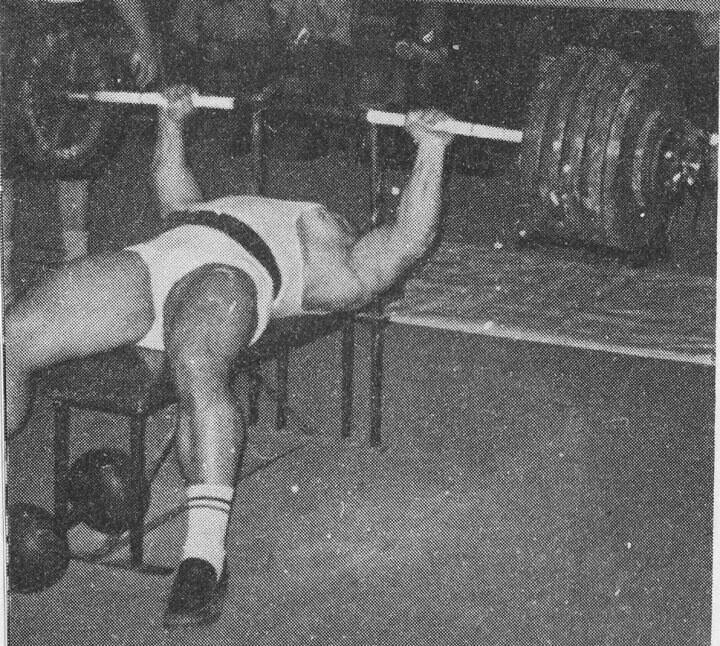 and Madsen, N., “Bench press technique of elite heavyweight powerlifters”, National Strength and Conditioning Association Journal, Aug-Sept, 44, 62-65, 1984. (10.) Rosentswieg, J., Hinson, M., Ridgeway, M., “Electromyographic comparison of an isokinetic bench press performed at three speeds”, Research Quarterly, Vol. 46, No. 4: 471-475, Dec. 1975. With the already vast number and variety of weight training and fitness programs in the U.S. still growing daily, it has become difficult (to say the least) for anyone to effectively discover the proper technique and training principles for developing muscle size, strength and power. With the boom in popularity of weight training in recent years has come an avalanche of new “experts” on weight training, most of whom have no scientific background or often even any significant experience in weight training. Unfortunately, the misinformation generated by such individuals in books, newspapers, popular magazines, television, cable, etc. further distorts the facts. What adds to the confusion is that if an individual follows even the most poorly designed weight training program some results typically will occur. However, progress is typically short-lived as the consequences of poor exercise selection, techniques and program design are eventually felt. Only through a blend of science and practical experience in weight training can advanced, productive weight training programs be effectively created, evaluated and disseminated. My goal in this book is to attempt to bring science and experience together, at least as far as one exercise, the bench press, is concerned. What I have attempted to do is combine approximately five years of research on this lift with the practical experience I have gained training on this lift for the last 15 years. I’m not personally a world record holder in the bench press, but am reasonably proficient, having gone over 500 lbs. in training. Fortunately, my insights on the practical side have been supplemented by my experiences training with top lifters like Bill Kazmaier, Bill Davis, Lars Hedlund, and many other top bench pressers and elite powerlifters that I’ve come in contact with via the National Strength Research Center, etc. 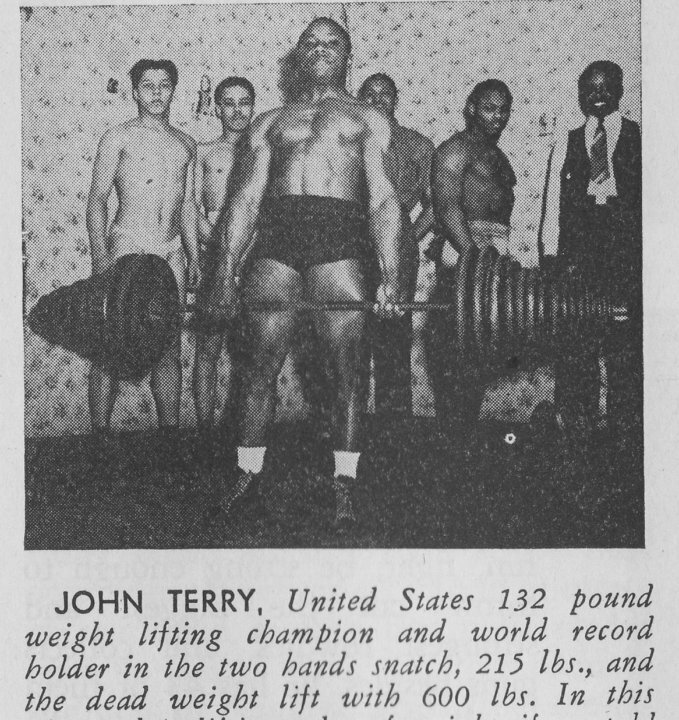 I have also met a great number of top lifters over the years at meets, etc. and have acquired training ideas and concepts from most of these “practical” researchers of our era. Hopefully, I will be able in this book to blend this practical base with the scientific results of our research on the bench press. By no means should the contents of this book be considered the “final word” on bench press techniques and training principles. Far from it. As a wise man said long ago, “The more I learn the more I realize how little I know.” Indeed, I have resisted the urge to write this book for several years now because I felt (no doubt from my academic background) that I did not have enough information to satisfactorily answer all of the questions I had about bench pressing. However, I have come to realize that this “state-of-the-art” sort of book may still be of value. Hopefully, it will. I fully realize, and you should also, that some of the ideas I present are not yet fully supported by objective, scientifically-valid research. The vast majority are, but to piece together the whole picture I have obviously had to tap my practical and intuitive insights where necessary. I have, however, attempted to keep you aware of what is fact versus what is supposition throughout the text. There is a LOT to the bench press, as I hope you’ll see in the coming pages. Technique is absolutely critical to success in this lift. Training for this lift is equally sophisticated, partially due to the complexity of the shoulder joint (the most complex joint in the human body) as well as the muscles that cross it. It’s an intriguing lift that continues to fascinate me both academically and personally. Discovering the “optimal” techniques and training methods for improving this lift has become an exciting journey for me. I hope that the contents of this book will be of similar interest to you and perhaps stimulate you to personally investigate (either “practically” or scientifically) this lift even further. Who knows, maybe one of us will someday bench press a world record, of help someone else to do so! The most important part of this book is the next chapter, on biomechanics. As I’ve said, technique is everything in the bench press! Be sure to go through this chapter carefully. I’m convinced it will be well worth your effort. The next most important chapter is chapter 3, on training methods, which also has a lot of valuable information. Concentrate on these two chapters and you’ll be well versed in bench press techniques and training theory. I would then suggest that you read Chapter 4 and evaluate where you are now and where you’d like to be. Design a six month or year long training plan. Select the technique changes and the training concepts that you want to implement in your workouts and do so. This book can then serve as a reference for helping you if your progress in bench pressing should slow down for some reason. Finally, consider this book a “starting point” for the development of your own optimal training program. Don’t be afraid to experiment, within reason. We are all still individuals with different structures, recovery rates from training, etc. Learn what works best for YOU! After all, isn’t the greatest joy in weight training the feel of success when a routine you designed works well? Even in the age of pharmaceutical aids, how well you train is still the ultimate key to success. Well, let’s get to the bench press!